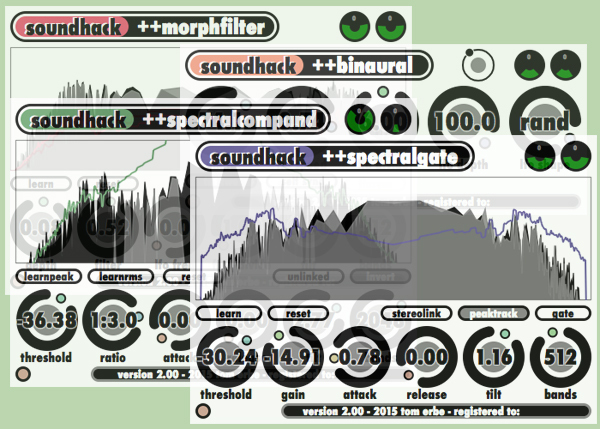 soundhack spectral shapers 2.11 is ready for macintosh in VST, AU and AAX; and windows in VST versions. download from the spectral shapers page. the bundle is priced at $75. the plugins have been given new names (a ‘+’ is added) as the parameters and curves are not compatible with the older plugins. most now have a band control, and ++binaural has a revised LFO section. many bugs have been fixed in this version, and copy protection has been removed. there will be an upgrade offered to current users in january 2018.